9 carat Gold Large Mens design Rings in various styles. Keeper rings, buckle rings, mens coin rings, Diamond set 9ct Gold Signet Rings and many more Mens styles. 9 carat Mens Diamond Ring in two tone 9ct Gold colours. 9 carat White Gold and Yellow Gold two tone Mens Ring set with two genuine Diamonds. Fancy design 9 carat White Gold Mens Diamonds set Ring. Chunky 9ct White Gold Ring set with real diamonds in a twist design top Gents Ring. Keeper Ring in 9 carat Gold. Fancy 3 row design large 9ct Gold Mens Keeper Ring. 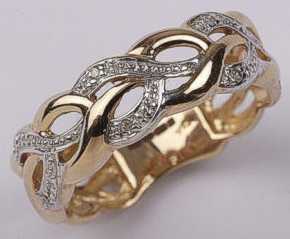 9ct Yellow Gold Woven Band Knot style Ring set with Diamonds. Wide 6mm weave Diamond Ring.